Every year, thousands of conventional total shoulder replacements are successfully done in Omaha, Nebraska for patients with shoulder arthritis. 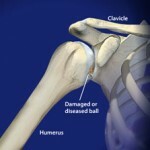 Reverse Total Shoulder Replacement Surgery, however, is not as beneficial for patients with large rotator cuff tears who have developed a complex type of shoulder arthritis called “cuff tear arthropathy.” For these patients, conventional total shoulder replacement may result in pain and limited motion, and reverse total shoulder replacement may be an option. A reverse total shoulder replacement works better for people with cuff tear arthropathy because it relies on different muscles to move the arm. In a healthy shoulder, the rotator cuff muscles help position and power the arm during range of motion. A conventional replacement device also uses the rotator cuff muscles to function properly. In a patient with a large rotator cuff tear and cuff tear arthropathy, these muscles no longer function. The reverse total shoulder replacement relies on the deltoid muscle, instead of the rotator cuff, to power and position the arm.